This article is about the 1935 Major League Baseball season only. For information on all of baseball, see 1935 in baseball. The 1935 Major League Baseball season. February 5 – Home run king Babe Ruth is released by the New York Yankees. May 24 – At Crosley Field, the Cincinnati Reds and the visiting Philadelphia Phillies played the first night game, which Cincinnati won 2–1. 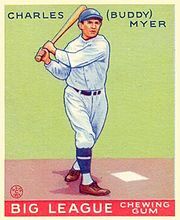 May 25 – Babe Ruth of the Boston Braves goes 4-for-4 with three home runs and six runs batted in. It is the last multi-homer game of Ruth's career, with the final home run being the first ball ever hit to clear the roof at Forbes Field in Pittsburgh. May 30 – Babe Ruth ends his playing career with the Boston Braves of the National League. August 31 – Vern Kennedy pitches a no-hitter as the Chicago White Sox defeat the Cleveland Indians, 5–0. 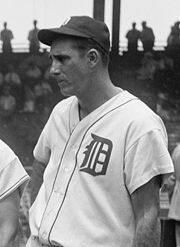 October 7 – The Detroit Tigers defeat the Chicago Cubs, 4–3, in Game 6 of the World Series to win their first World Championship, four games to two. This was Detroit's first Series victory after failing to win four previous times. November 26 – The National League takes over the bankrupt, last-place Boston Braves franchise after several failed attempts to buy the club. The league takes over only temporarily, until matters can be straightened out.